I always look forward to My Little Box arriving at my door, when I first subscribed (this is out of my hard earned cash) I posted a review but I haven’t done so since. When looking at my visits I noticed that it was one of the most searched for posts, so I thought I’d bring it back for everyone out there who was curious about the box. I love the little hand drawn inspirational quotes you get in your box, I’m saving all mine up to put them above my desk when the study is ready. You always receive the magazine, this months was a little different as it folded out into a giant poster. A cute little stationary number first. In another illustrated box there was a rotating stamp and ink pad. This stamp boasts phrases such as, Merci beaucoup, made with love and oui. I can see myself using this in cards to add something a little different for the receiver. Next I moved on to my little drawstring bag. I always think it’s a nice touch that you get all your beauty goodies in a bag like this. They are great to hang on to, I use them to store toiletries in if I’m going on a short break. The first thing I pulled out was My Little Beauty’s Repairing Mask for Dry Ends. I’m excited to try this out because of the length of my hair and the fact that I now have ombre ends. I guess my hair could do with a little pampering. Next out of the bag was COWSHED’S Wild Cow Invigorating Body Lotion. Made with all natural ingredients this lotion promises to leave your skin summer ready and my skin needs all the help it can get at the moment. I’ll be applying this to my legs after shaving to leave them silky smooth. And finally I was greeted by a little cloud – all I had to do was cut it open to find my surprise. This was created especially for the box by jewellery designer Delphine Pariente. The gold tag reads ‘bonne étoile’ which means ‘lucky star.’ I thought this was such a lovely little piece, you could easily wear this around your neck or wrapped around your wrist. 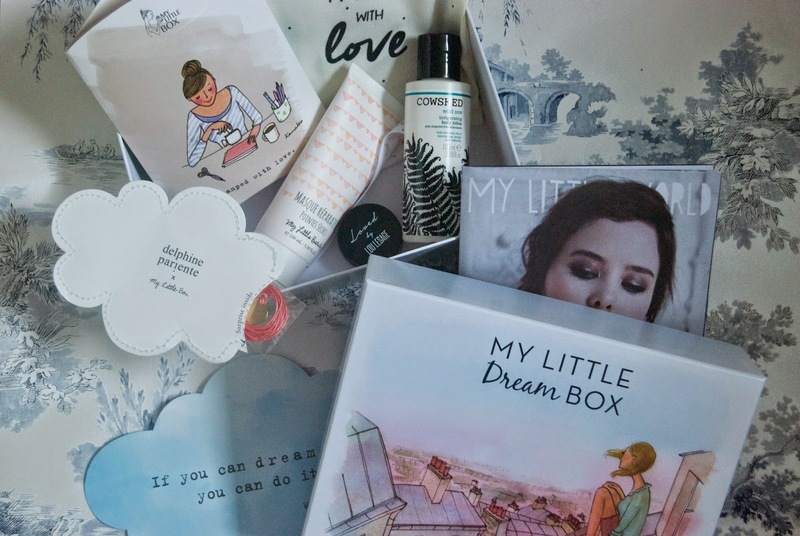 I can’t recommend My Little Box enough, I love the surprise of discovering what’s inside and you really get your moneys worth too!